That was written back in April and the mag has stuck with them, and just named that single, “Best of Friends,” as the NME‘s #1 single of 2013. (Tame Impala’s Lonerism was the #1 album.) With the UK in the throws of hype-fueled rapture, it’s time for America (well the Northeast at least) to get very… cautiously curious. Palma Violets will be coming over in January for a few North American dates, including Shea Stadium on January 19 (no word on advance ticktets yet) and two shows at Glasslands on 1/23 and 1/28 and tickets to both Glasslands shows are on sale now. UPDATE: The second Palma Violets Glasslands show got moved from 1/30 to 1/28 and changes were made in this post to reflect this. The Suzan is now playing at Glasslands on 1/30. The 1/23 show is with Canadian funsters Hollerado and the 1/28 show has El Sportivo on the bill. Right after their stateside visit, Palma Violets will release their debut album via Rough Trade which was produced by Pulp’s Steve Mackey. They’ll also be part of the NME Awards Tour 2013 in February which packages a bunch of new bands together and trucks them around the UK. In this case, Django Django, Miles Kane and Peace. 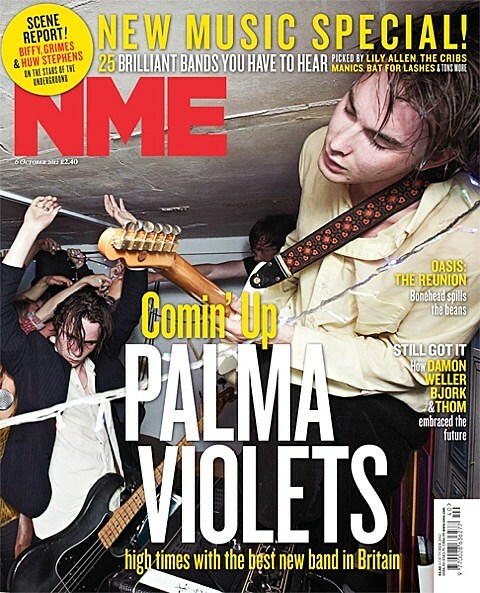 The full list of for the NME‘s tracks of the year is below, along with a Spotify playlist, along with all tour dates, Palma Violets’ videos and a live clip as well. 18 Arctic Monkeys – R U Mine?